Enclosed Grease Tanks Are Used In Foodservice Applications For Restaurants, Drive Ins, Delis, Caterers And More. 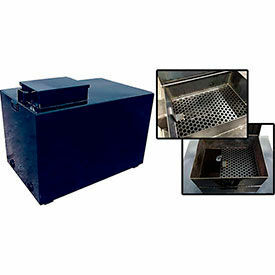 Enclosed Grease Tanks are made with heavy 12 gauge steel and powder coating to provide long lasting durability. Material also resists chipping and corrosion. Large 19" x 14" pour area has locking/sliding screen for easy product evacuation while still providing security. Gallon capacities are 125, 215 and 300. Dimensions vary per model.